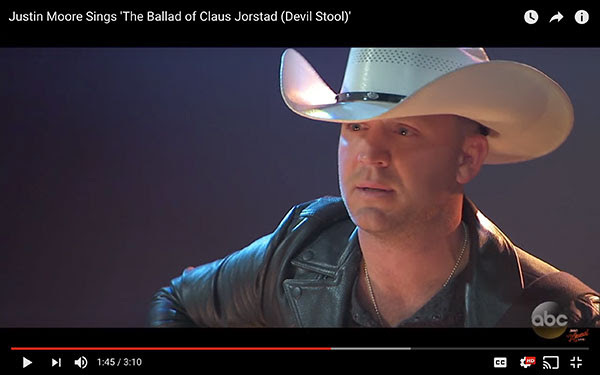 NASHVILLE, Tenn. – Chart-topping, ACM award-winning artist Justin Moore’s performance in a “Jimmy Kimmel Live!” skit landed an Emmy nomination in the Outstanding Original Music and Lyrics category for “The Ballad of Claus Jorstad (Devil Stool).” The spoof was written by Jimmy Kimmel and Gary Greenberg. "If you had told me I would be a part of earning an Emmy nod for singing a song about what I did, I would have thought you were crazy. Haha," said Moore. "Nonetheless, it's very cool to hear. I'm excited for Jimmy and his crew. Hopefully, we can bring it home. They told me this week that they would share it with me, so it would be pretty cool to add an Emmy to the mantle." 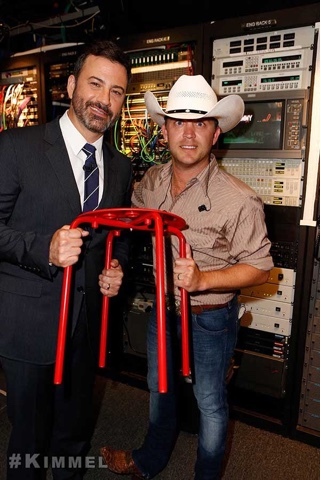 Watch here as the platinum-selling artist introduces his wicked sense of humor to the late night audience as he performed the song about an unlucky man in Norway who had an unfortunate run-in with an Ikea stool in the shower. The 2017 Emmy Awards will air live on CBS on Sept. 17 at 8PM ET. A complete list of 2017’s Emmy Awards nominees is available on Emmys.com. Justin performed both his latest hit single "Somebody Else Will"and title track "Kinda Don't Care" Tuesday night on Jimmy Kimmel Live! Watch them both here. Aug. 04 - Kearney Amphitheater - Kearney, Mo. Aug. 05 - Country on the River - Prairie du Chien, Wis.
Aug. 07 - Sturgis Buffalo Chip Amphitheater - Sturgis, S.D. Aug. 11 - Foxwoods Resort and Casino - New London, Conn.
Aug. 12 - Sands Steel Stage - Bethlehem, Pa.
Aug. 13 - Tags Summer Stage - Big Flats, N.Y.
Aug. 19 - Hampton Beach Casino Ballroom - Hampton Beach, N.H.
Aug. 26 - Redding Civic Auditorium - Redding, Calif.
Aug. 27 - Enumclaw Expo Center - Enumclaw, Wash.
Sept. 03 - South Dakota State Fair - Huron, S.D. Sept. 14 - Masonic Auditorium - Portland, Ore.
Sept. 15 - The Farm - Selma, N.C.
Oct. 28 - Curtis-Hixon Park - Tampa, Fla.